MUM ON A PLANE ✈️ – Ready, set, GO! 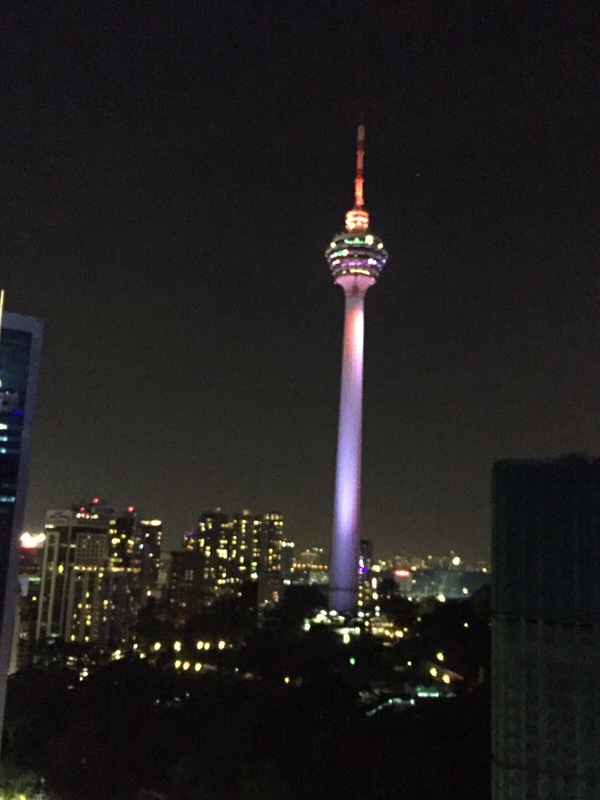 A short trip to Kuala Lumpur, Malaysia with the kids in tow. I’ll admit, Malaysia was my idea, all my friends who’d been there raved that it was ‘amazing’, the food was soooo good. Honestly, I just wanted to see the Petronas twin towers. 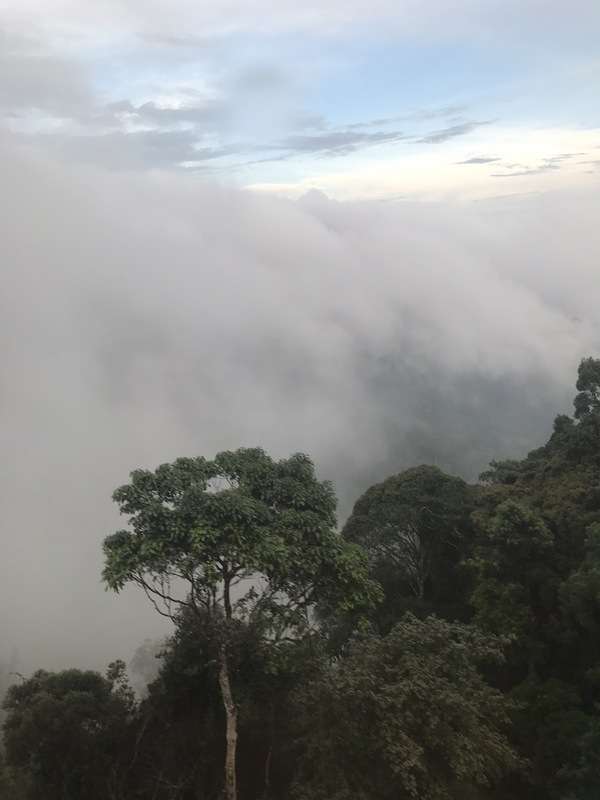 So we booked to stay for two days in KL and then two days in Genting Highlands. 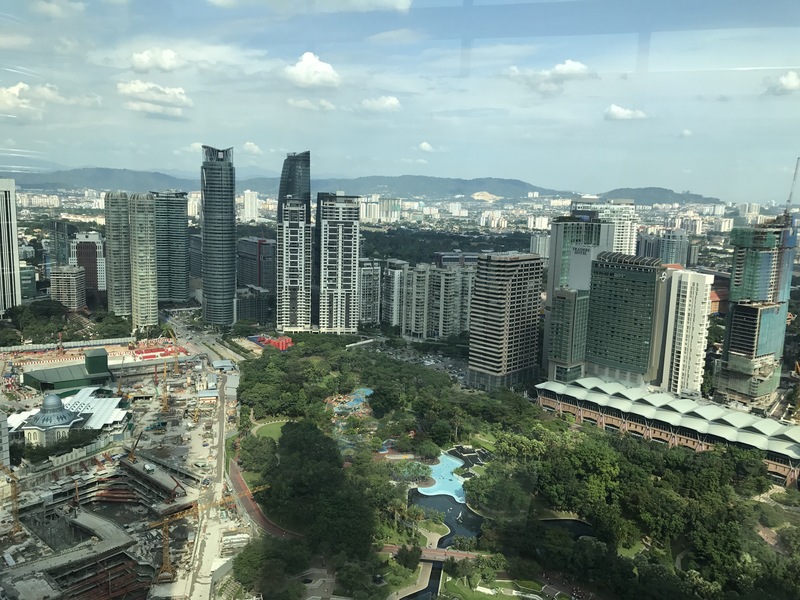 We were flying from Singapore so the flight was only 40 minutes and the journey from KL airport to the city centre took and hour, altogether a relatively short journey. 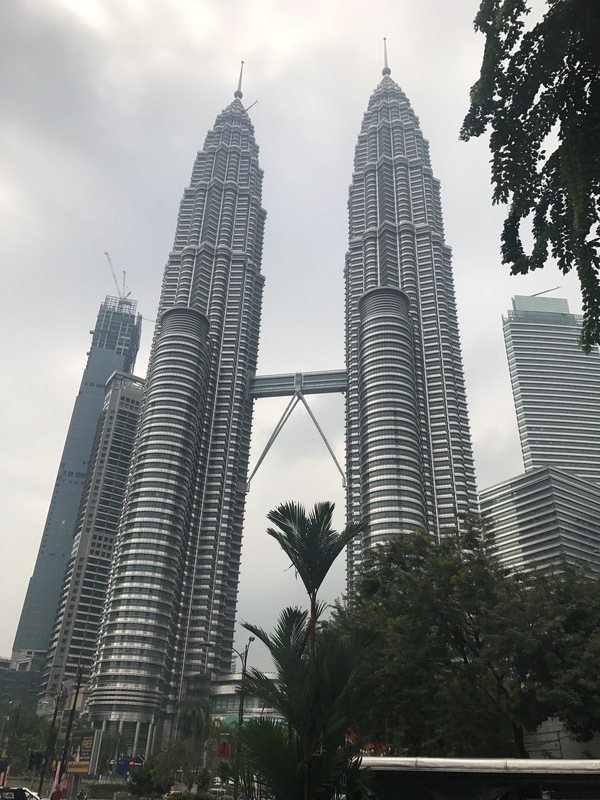 We arrived to our apartment near the Petronas Twin towers at around 13:00. 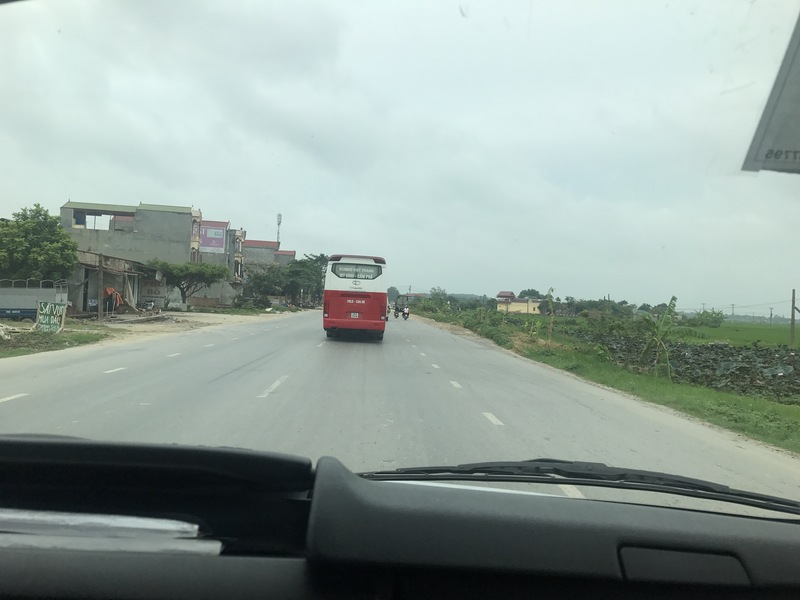 We had already eaten lunch at the airport so we were just going to put our things in the apartment and start exploring. However, our children had other ideas… they needed a bit of down time in the apartment to just play and unwind. The temperature outside was a scorching 34 degrees Celsius so whilst I wanted to explore, I didn’t want to be out in that heat. Instead, we ventured out around 16:00. Every bit as magnificent as it looks. Inside the towers is a shopping mall with all things designer and a variety of food places. At the back of the towers is a park where you could let your children marvel at the fountains or you could walk a little further to the water park and let them cool down (of course just ensure you’ve got towel and a change of clothes). Now that I’d ticked that off my list, I was happy but my hubby insisted that we should go up the towers, since we were here and all. For my 6 year old son, this was something he wanted to do too. Tickets for the towers are limited and whilst you can purchase online, you can also buy on the day, but it’s a first come first serve basis and you don’t get a huge choice of time slots but I don’t think that matters too much. The view from the tower is incredible. You do get a 360 degree view from the top of the tower and it’s worth every penny spent. 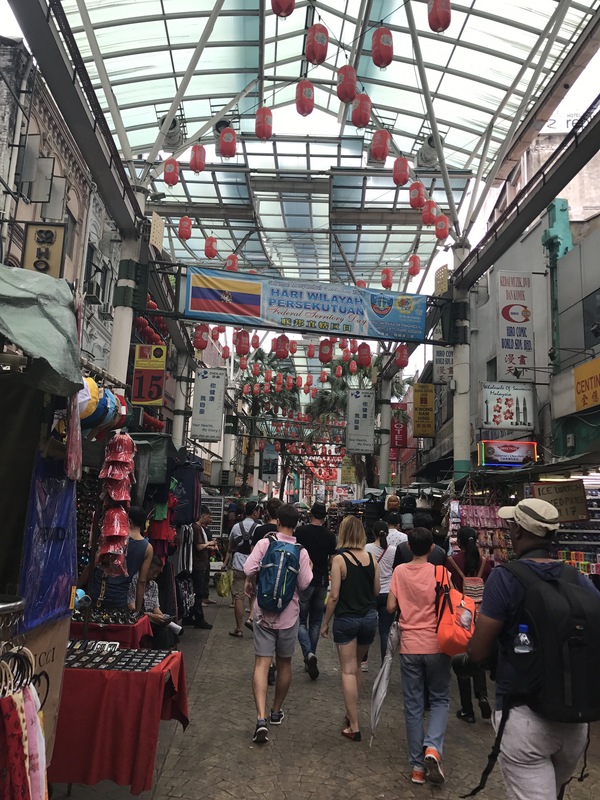 On our second day we ventured to the famous Petaling market. It was ridiculously hot, so hats and sunblock were essential. We took frozen bottles of water because the children could cuddle them to stay cool. There is a variety of things to buy here, locals expect you to bargain for things. Thank goodness things were fairly cheap because our son wanted model airplanes. Most negotiations were about the number of model airplanes he was allowed. I enjoyed the atmosphere of the market. It was a buzzing place filled with tourists and locals alike. Food places are many and we chose to eat at a food court (Keep in mind that toilets don’t always have soap, so antibacterial hand gel and wet wipes are very handy) because I wanted to have authentic Malaysian food. As it’s a food court, there were many options and the children ate well. 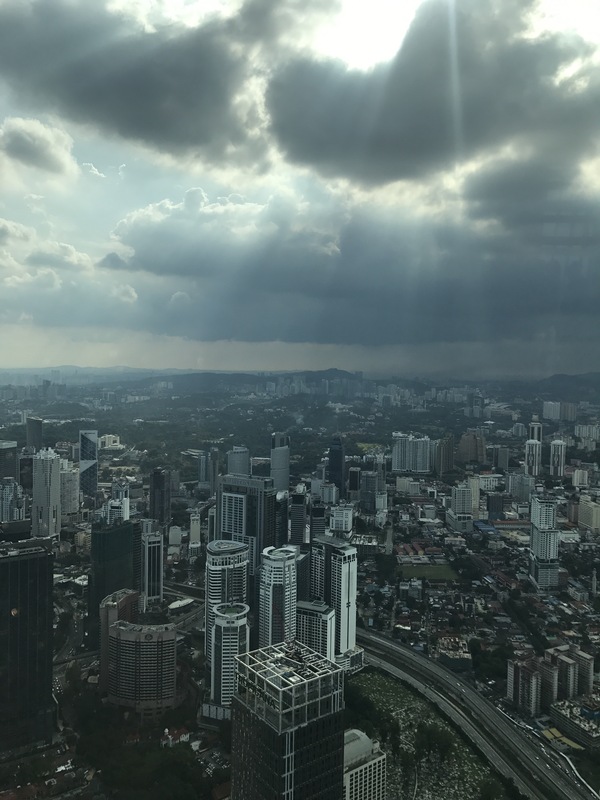 KL is a huge city and there is so much to do, so having a plan on what you want to do is a good idea. I’ll admit the heat in KL was a limiting factor in how much we could do in two days but I don’t feel that we missed out on anything. 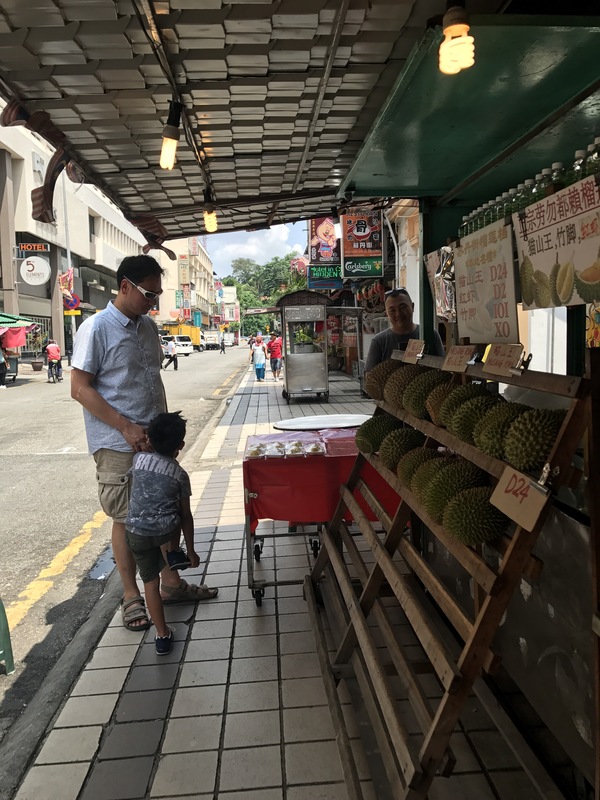 Durian – either you love it or you hate it… I don’t love it..
We spent two days in KL before heading to Genting Highlands for a much needed break from the intense heat. 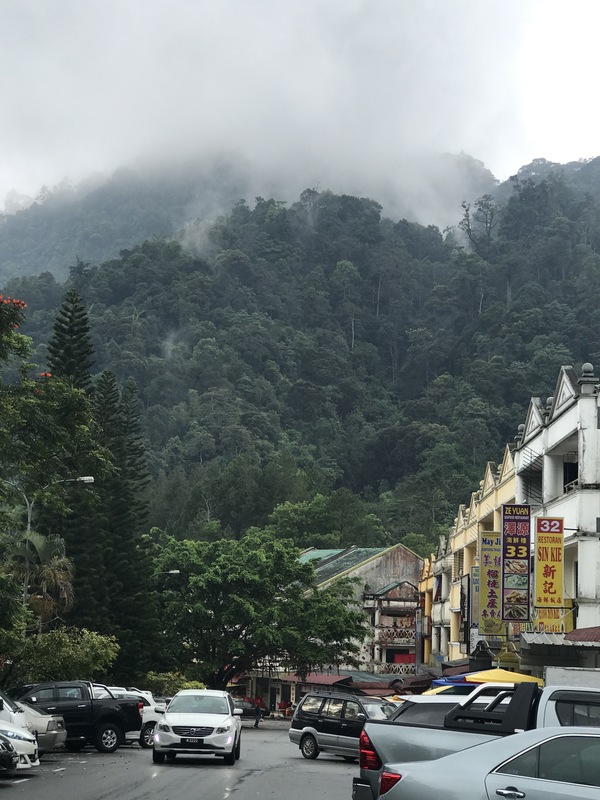 We took a taxi to Genting Highlands which took an hour and did not cost very much. This option was preferable because of the children. 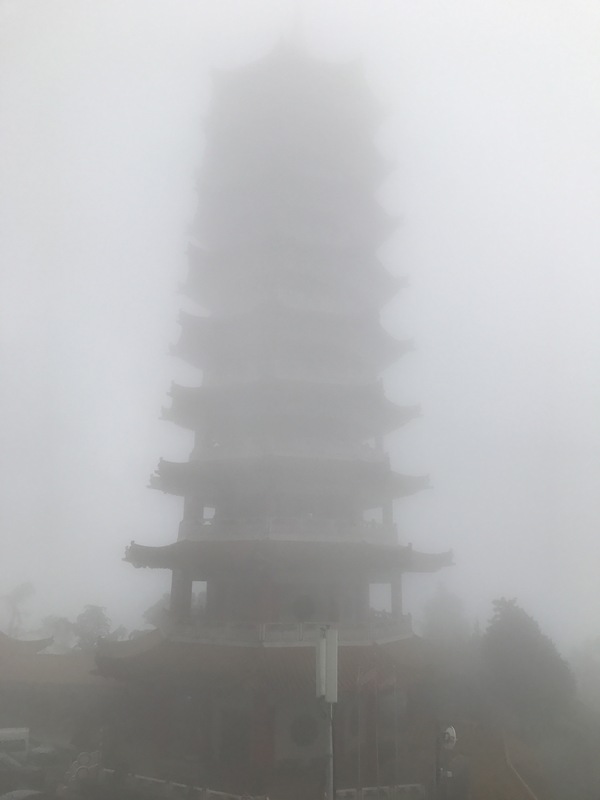 Our hotel was right at the top of the mountain which was so cloudy that visibility was minimal. 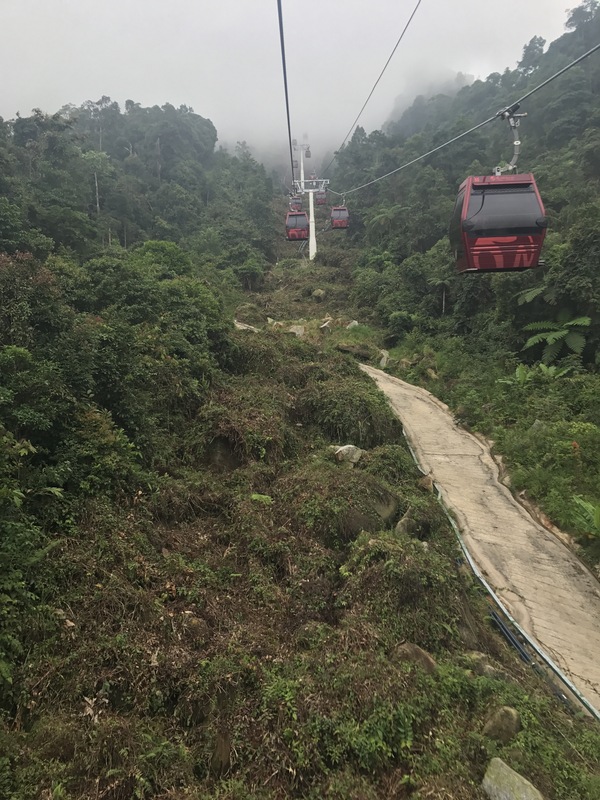 We took the “skyway” which is a cable car from about halfway up the mountain to our hotel. Our 6 year old loved this! He was super excited. 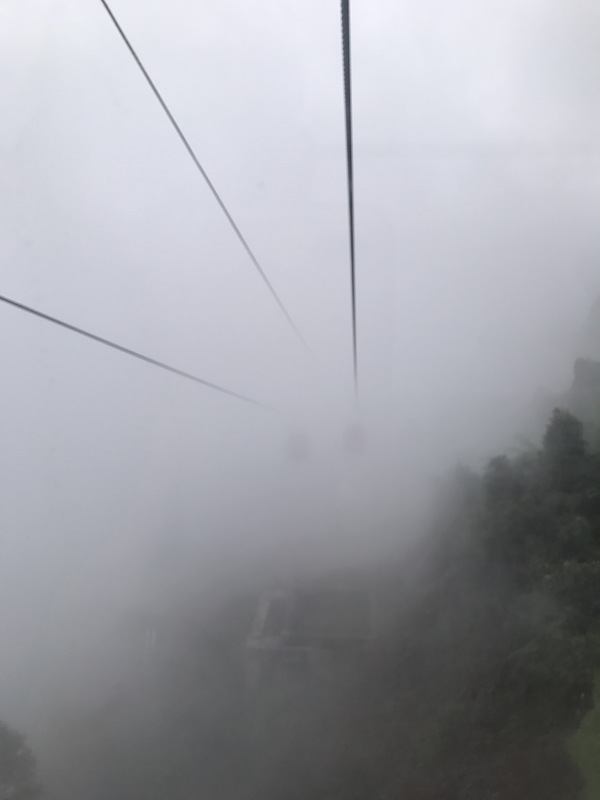 This cable car journey is one of the longest in the world so definitely worth going. The First World Hotel is huge and busy. We were not impressed with the rooms but the views out over the scenic rainforest is beautiful. The theme park is not yet opened and there were extensive renovations going on. With that said, just exploring what the hotel had to offer took the best part of a day. There are numerous eating places and casinos if you wanted to check those out. My children we literally spent on just exploring with us. 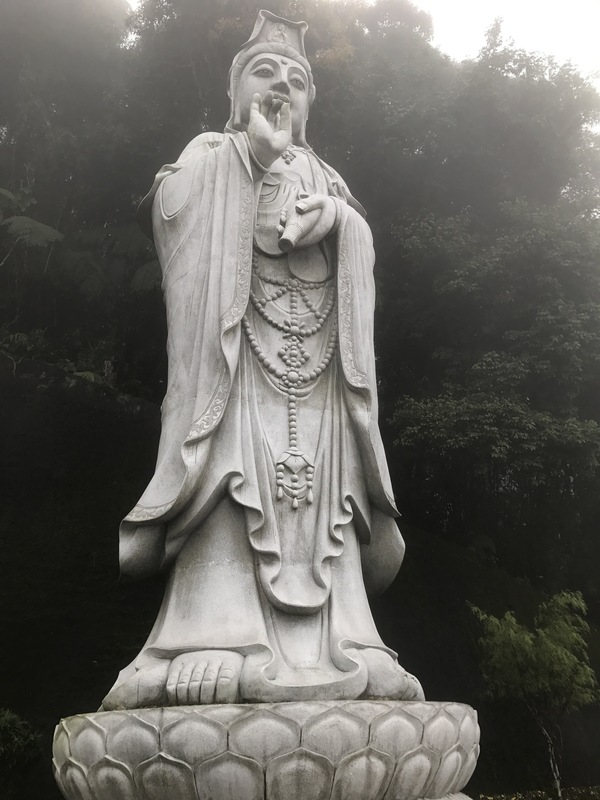 We took the cable car to the Chin Swee Caves temple. It was a quiet day. We had lots of time to explore the temple and the caves. Being surrounded by such natural beauty is simply wonderful. The following day we visited the Genting strawberry farm. Yes …. I was surprised too. My children absolutely loved it. 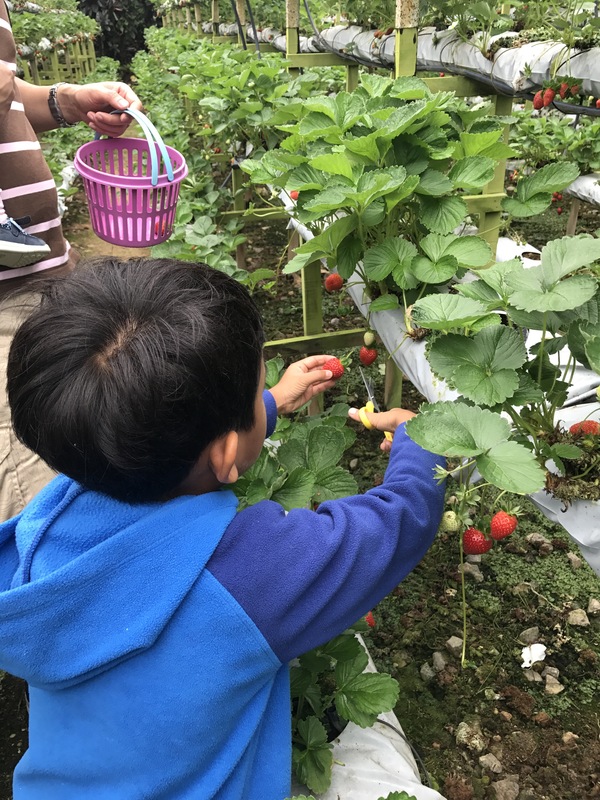 They picked strawberries and enjoyed the experience but best of all they enjoyed eating every single one ! The only warning I’ll give about this farm is it’s a bit of a tourist trap in that there are photographers trying to get you to have your photos taken and if you want them you’ll pay quite a bit for them. Just be polite and decline because it ruins the experience of the farm and the beautiful flower gardens! The Main Street with restaurants. You can eat well very cheaply here in Genting. 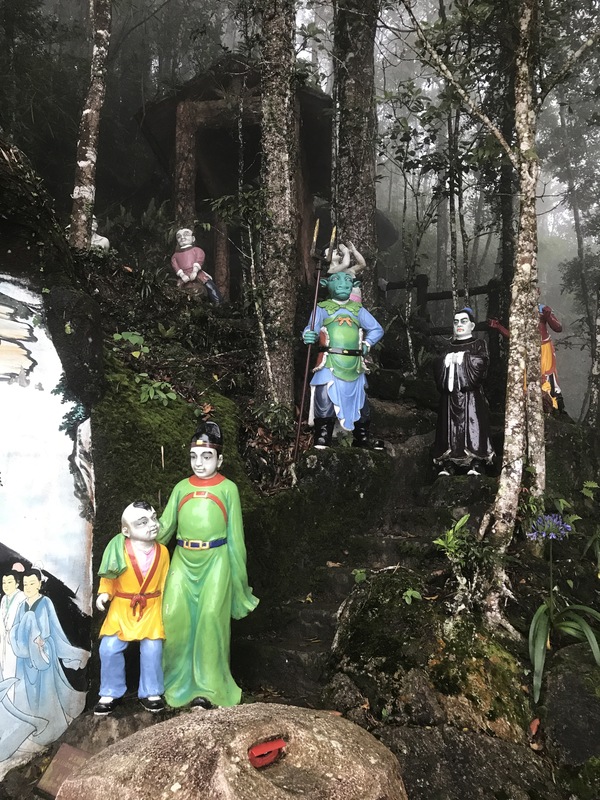 Malaysia has so much to offer in the city and of course out in the rainforests. The places I went to are just a taste of what’s on offer in this huge country. I would love to go back one day and explore more of this place. Can you do Malaysia with your children? Of course you can….. it’s all up to you! 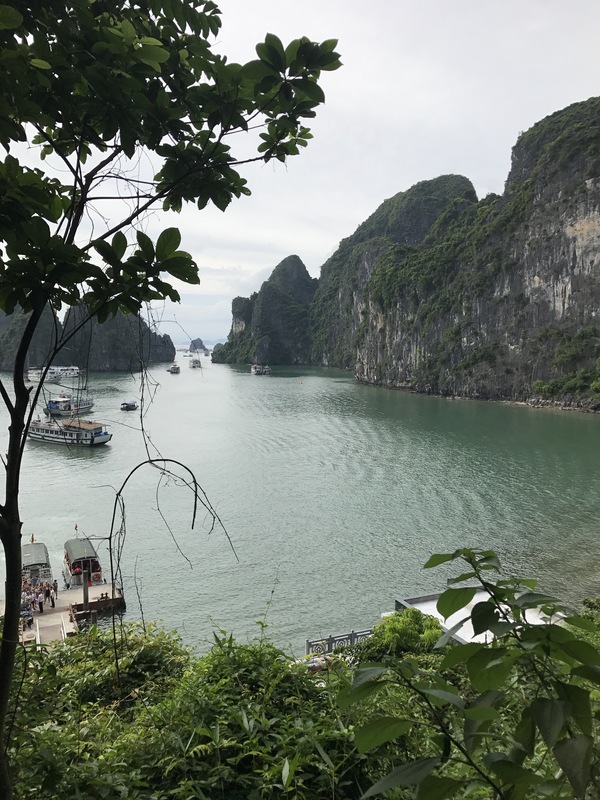 Ha Long Bay, Vietnam with the kids…. the good, the ‘could be better’ and the wonderful. 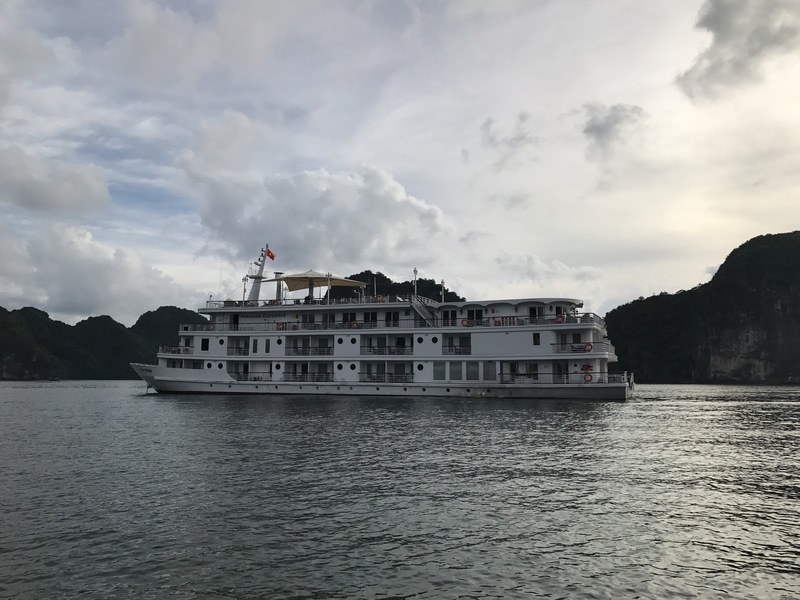 Our second stop in Vietnam was Ha Long Bay. 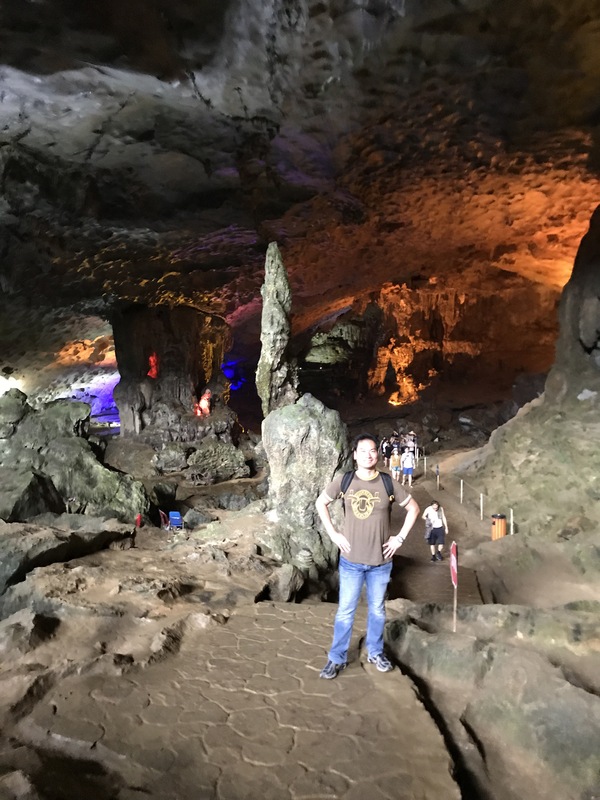 A world heritage site famous for its limestone mountains and only a 4 hour drive from Hanoi including a 20 minute stop. The journey itself provided much to be seen and I couldn’t help but marvel at the beauty I saw. The children managed this journey quite well. Firstly, a good breakfast was had and tablets provided much entertainment. We had a portable WIFI device for the family to use as this was a cheaper alternative to using our mobile phones. My 18 month old slept in her car seat for two hours of the journey and my 6 year old also had a snooze for an hour or so. It helped that we had travel pillows and a blanket for comfort. We boarded the Paradise Elegance cruise ship for a two night, three day cruise. The ship was beautiful and our room was complete with an ensuite and a dressing area which was big enough to have space for all our luggage. We even managed to set up the travel cot in there. That said, we would have all slept very comfortably on the super sized and extremely comfortable bed! The food was surprisingly really good. There was buffet breakfast and lunch and an a la carte dinner. There was something for everyone, even the fussiest of eaters. 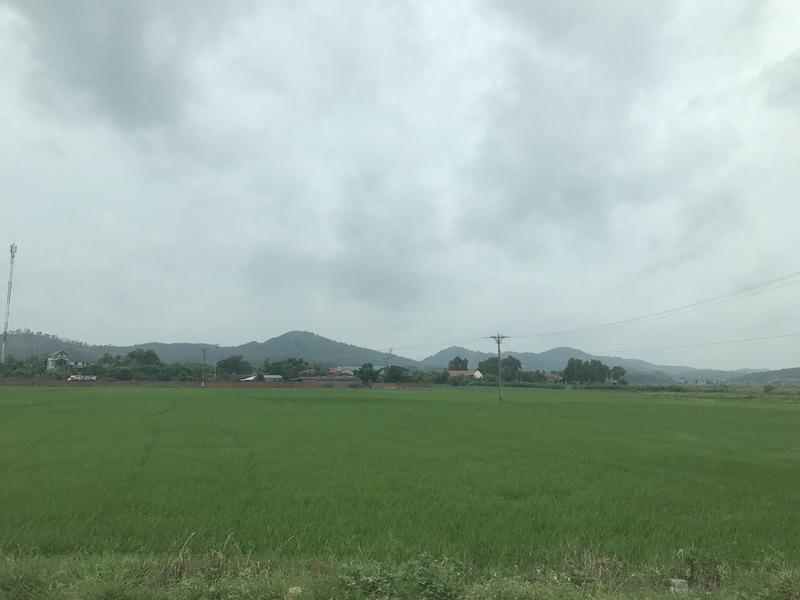 There were enough activities planned for those who wanted to do more, such as visiting caves, a pearl farm, a floating village and a bamboo bridge, kayaking, a visit to the beach, Tai Chi and a few more. Whilst most of this cruise was fantastic… there was only one downside. What happens when it rains? Unfortunately, we had thunderstorms for most of our first day. The original schedule included a variety of activities with lunch on an island and then we’d return to the ship around 3 pm. Whilst we were supposed to be off having a lovely time doing said activities during the five hours, the ship would make its way back to port to drop off other passengers who were checking out and pick up new passengers. Am guessing they also carry out other necessary activities to ensure smooth running of the ship. Due to the storms, we couldn’t do the activities, instead we headed back to port and observed the chaos that descended. We used the time to drink coffee, eat cakes and have massages, I even read my book, so perhaps not a total waste of time but it would have good to have some alternative activities for occasions like these. Now that I’ve told you what the only downside to the cruise was, I can let you in on the wonderful. If the sky is clear, you’ll experience a beautiful sunrise around 5.30am and sunset around 6.30pm during the summer months. At six am on both mornings, you could participate in tai chi on the deck, followed by first breakfast of pastries with Vietnamese coffee. I loved drinking my morning (7 am) coffee on the deck surrounded by such beauty. My hubby enjoyed sleeping late and slept in with the kids. (Chalk and cheese). Sung Sot (Surprise) CavesWe visited the Sung Sot (Surprise) caves which were spectacular. It’s a bit of a trek with approximately 700 steps to climb but totally worth it. The view from the top of the steps is incredible. 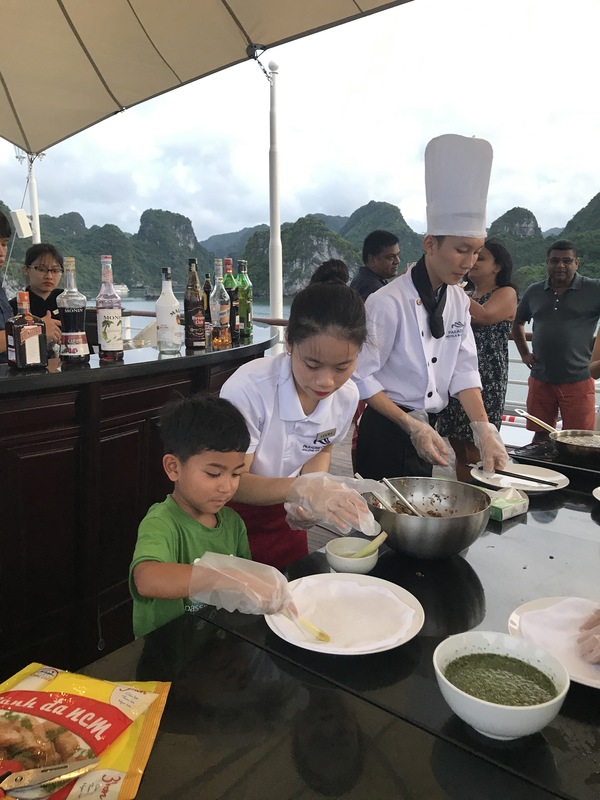 Cooking class for kidsThere was a Vietnamese cooking class on the upper deck on both evenings where the children were invited to participate. My six year old son learnt to make spring rolls which he also got to eat! ⭐️ ⭐️ ⭐️ ⭐️ ⭐️ ! 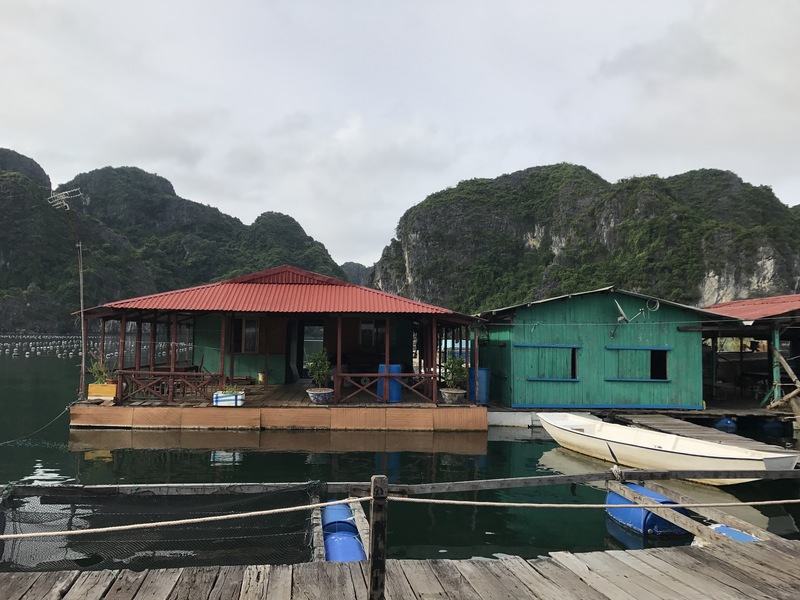 Set amongst the limestone mountains the pearl farm was an absolute gem! 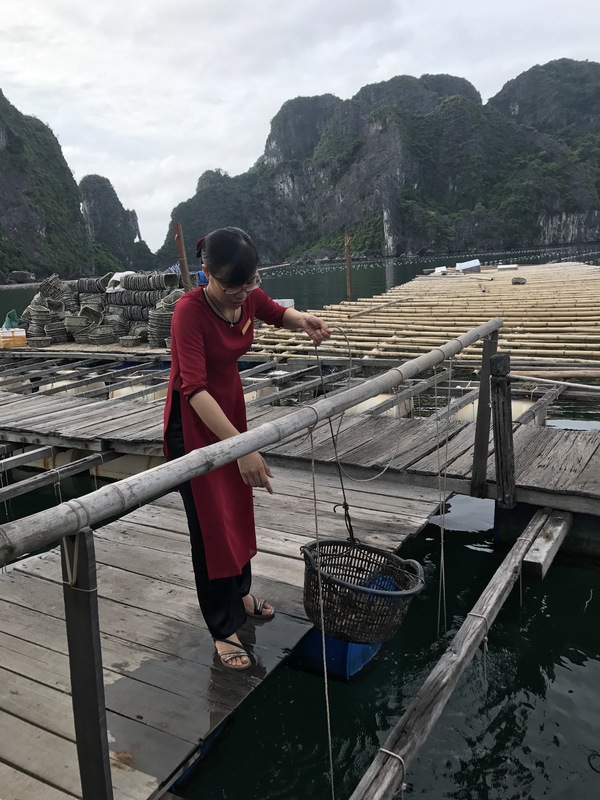 We had an opportunity visit to a pearl farm in Ha Long Bay which turned out to be very educational not just for my son, but also for me! There’s so much to learn about culturing pearls and so much work involved. 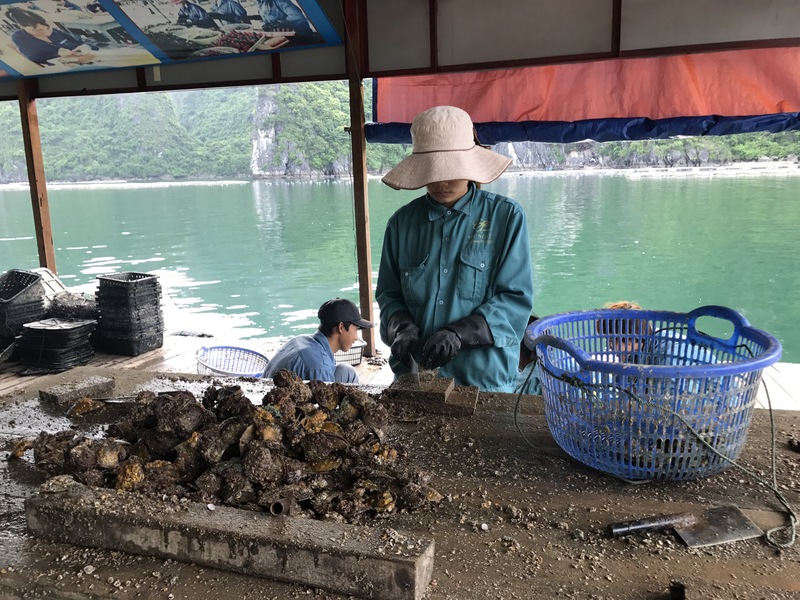 They staff were very thorough in explaining and demonstrating exactly how pearls are cultured and how long it takes.These are just some of the “wonderful” of Ha Long Bay; other activities that were also fantastic were squid fishing and kayaking. 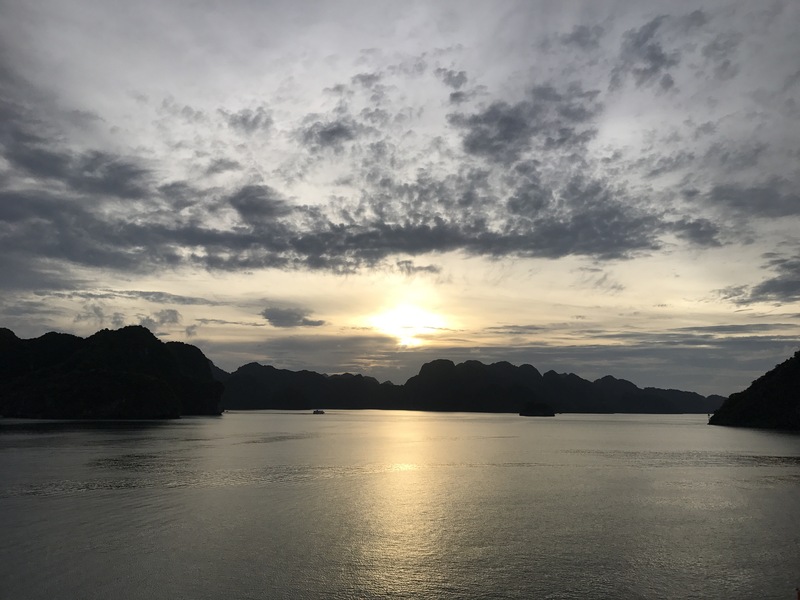 If you ever decide to visit Vietnam, the limestone mountains of Ha Long Bay is definitely a place to visit, with or without the kids! 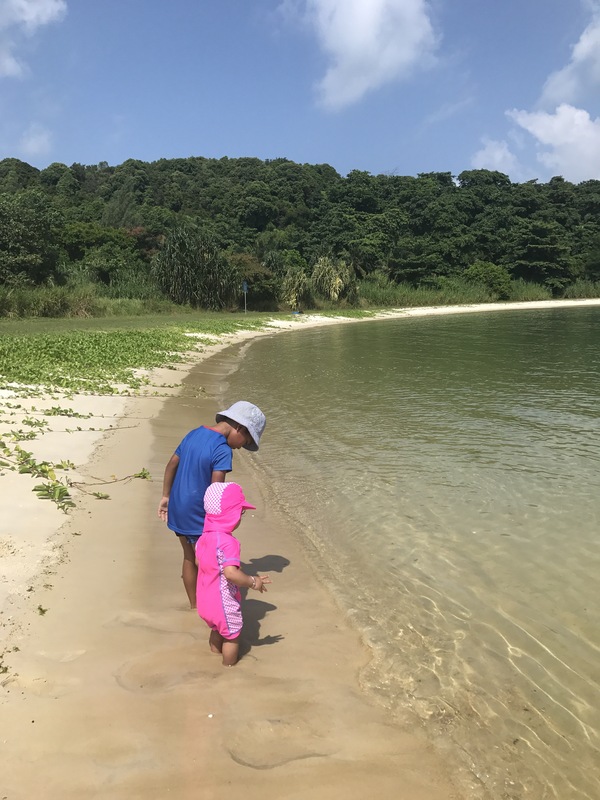 A day out on the islands around Singapore – with the children. 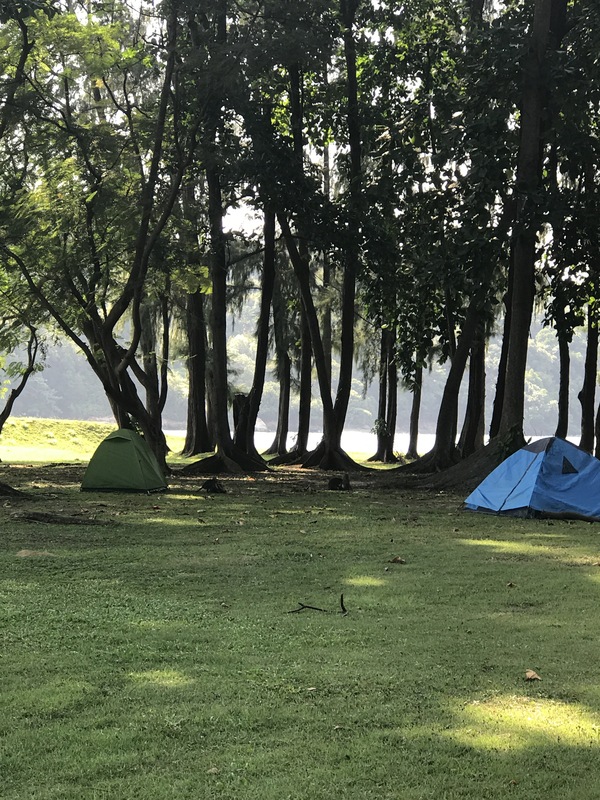 If you’ve got an extra day in Singapore and want to do something not too ‘touristy’ then the islands are a good choice. These islands are located south of Singapore. Before you head off to the islands, here are a few key things to remember. It is hot…. so if you are like me and are use to temperate climate, this will be an unbearable heat for you. At 35 degrees Celcius, hats and sunblock are essential. Do bring lots of cold water and a picnic since there aren’t any places to buy food, however, they are in the process of building a food court on Kusu island. I suggest that if you have a sun cover for your push chair bring that too and maybe a couple of towels to lay on the sand. Now, I did find mosquitoes on the island so mosquito repellent was very handy at that point. St Johns Island– history tells us that this island was previously used as a quarantine station for Cholera , Beri Beri and numerous other illness in the 19th century. 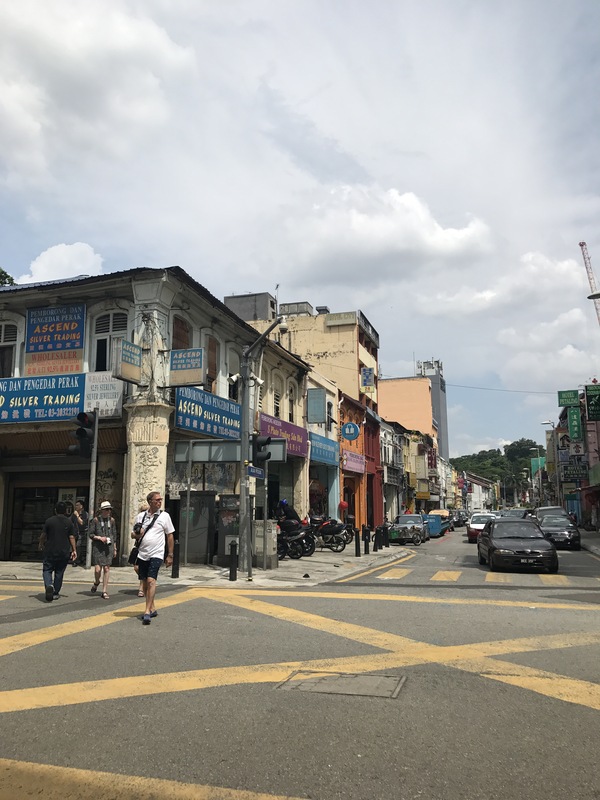 I had a fortunate experience of a local telling me his history of coming to Singapore as a child from China. 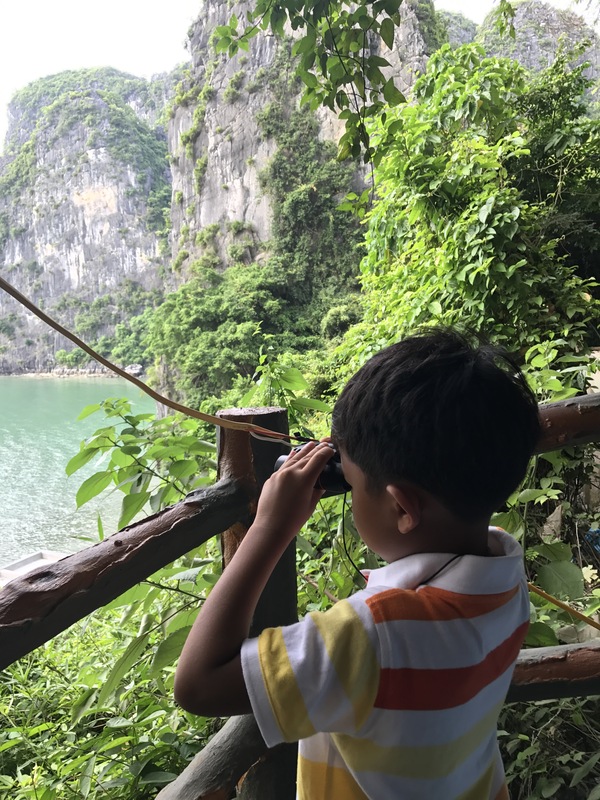 I really enjoy hearing stories from people and I enjoy learning about the history of a place, but we also took this trip to the islands so the children can experience a very different side of Singapore. You can walk around St. John’s island and enjoy the beautiful scenery and swim in clear green water. There are wild cats and monkeys who are not shy of saying hello but I wasn’t brave enough to touch them or allow the children to pet them. There are lots of locals who use the islands to fish and there is a fishing farm just off of St Johns island. The only down fall of this island is that there is only one toilet and it’s not in immaculate condition but there’s soap and water. 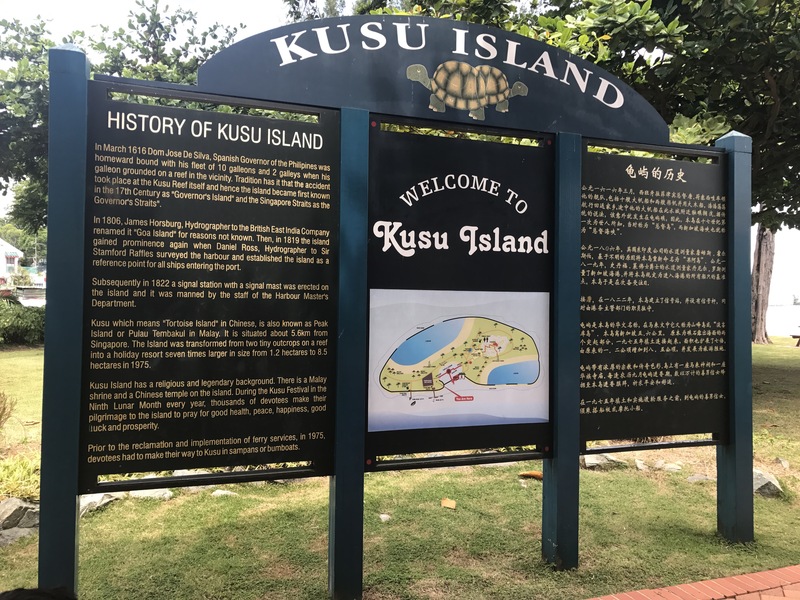 Lazarus island– We walked over to Lazarus island which took us about 30 minutes (we lingered to watch the monkeys and cats). ﻿Once we got to Lazarus island we found our spot and set up our picnic area. There were several boats which anchored nearby but still a good distance away, enough for us to swim. There were other locals enjoying jet skiing and other water sports. We had a kite and tried to fly that, sadly, we weren’t very good at it. There are a couple of pavilions and lots of shady trees where you can shelter from the sweltering heat. After lunch, lots of hydration and a reapply of sunblock, we strolled back to the pier to catch the boat to Kusu island. 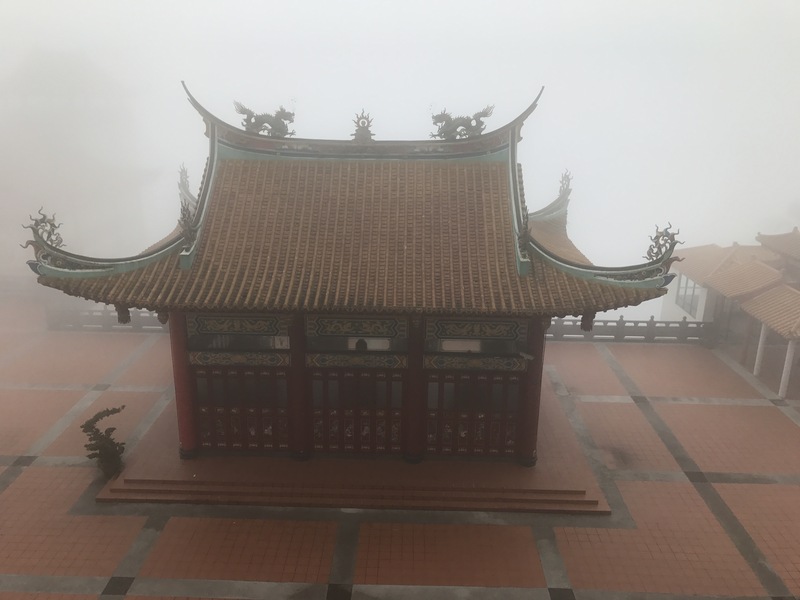 A beautiful island with a Malaysian and a Chinese temple. The island is home to monkeys, cats and tortoises. We spent our time walking around and enjoying the tranquil setting. I look forward to going back once the food court is finished. All in all a good day spent relaxing. Flying solo with a toddler! A long haul event…. I’ve never been one to shy away from a challenge, and flying solo with my daughter was certainly going to be a challenge on our long haul flight to Singapore. Now, I’ve done the long haul flight with both my children last year to the Bahamas and that went well; firstly because my daughter was between 5 and 6 months old. That meant it was easier to feed her, carry her and getting her to sleep wasn’t too much of a problem. 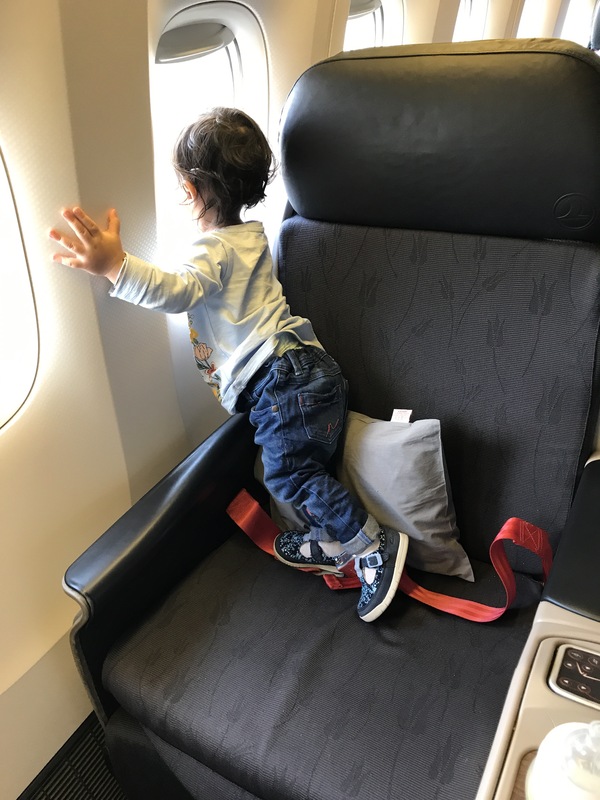 My son is a seasoned flyer and has always been easy to entertain so I didn’t find that particular journey stressful; but this time round, it was eventful. It was a choice to fly to Singapore via Istanbul. A direct flight was approximately 13-14 hours long. The thought of doing that with a ‘busy’ toddler just didn’t appeal to me but it had to be done, after all, we were off on a family holiday. Take off was a challenge, we were delayed on the tarmac at Heathrow for 45 minutes and how they expected her to sit still with a seatbelt attached to her was beyond me, especially since the plane was not moving. So instead of listening to her scream, I removed the seatbelt and let her walk on the floor until it was time to take off. Up in the sky things didn’t get better, she refused to eat, perhaps due to teething (the canines were popping through)and also, it was her bedtime so she wanted to sleep and since I couldn’t just put her down to sleep in a cot, I opted for rocking her to sleep but not before she wailed for 15 minutes. (Poor people on the plane). No one complained or even batted an eyelid to me and the very lovely professor who sat next to me was very understanding. Soon enough she fell asleep for a grand total of an hour and a half, during which I ate my dinner. (Quite nice food actually!) I spent the last hour and a half of the first leg of our journey singing nursery rhymes, reading books, watching songs on the iPad and letting her walk around the plane. Truth be told, even though breaking the journey up by having a transit stop made the time to get to our final destination longer; I welcomed the stop. The airline had my push chair brought to the plane side after we landed and I didn’t need to worry about the rest of my luggage as it was tagged to the final destination. Getting off the plane at that point meant that I could stretch my legs, freshen up and grab something for my daughter to eat (in case she was hungry). The airport was busy and luckily the gate was the same as the one we got off at so I didn’t need to go far… but me being me I went for a jolly! It was easy to get refreshments and I did a quick change of clothes for myself and my daughter. Something comfy to sleep in. Soon enough we were back on the plane and in the air for the next 10 hours. Happy days…. She managed 6 hours of sleep and I got 4. We were arriving in Singapore at night so we would only be going straight to sleep once we got ‘home’; so a little sleep deprivation was ok. I was hoping it would help the jet lag (it didn’t, am awake writing this at 3am). When we both woke from our sleep, we still had 4 hours to go and so I spent 4 hours entertaining my 18 month old daughter by singing, reading, watching programmes I’d downloaded on the iPad and letting her walk around. Again, she didn’t want any food, she only managed to eat some puréed fruit in pouches that I had packed with me. I wasn’t worried because I knew she’d make up for it once we got there. After all my singing and entertaining, we finally landed. Passport control and baggage reclaim was easy for us and soon we were being greeted by our family! Luckily the journey home wouldn’t be a solo event…. I’ll have my hubby to help. Pack enough entertainment for your child. Always take comfy clothes to sleep in. Try to break up long haul flights with the longer leg matching their sleep schedule. Don’t worry about what everyone else is thinking, remember you can’t reason with a toddler. Let the summer holidays begin! 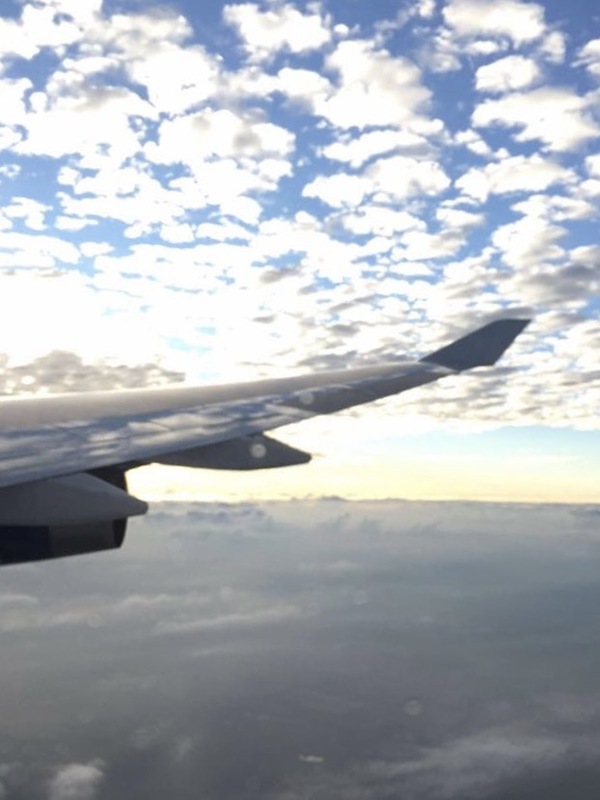 What to pack and tips for your long haul flight. As schools come to the end of the academic year, I know I am not alone in getting ready for the joys that the summer holiday brings- juggling work with childcare, keeping the children entertained, making play dates (because you know how much they miss their friends when they don’t see each other for like 12 hours!🙄) and of course ensuring that you’ve remembered all the things to pack in your luggage for the all important summer holiday! This year, we are going on a holiday to Singapore, Vietnam and Malaysia. That means being prepared for everything I could possibly think of. 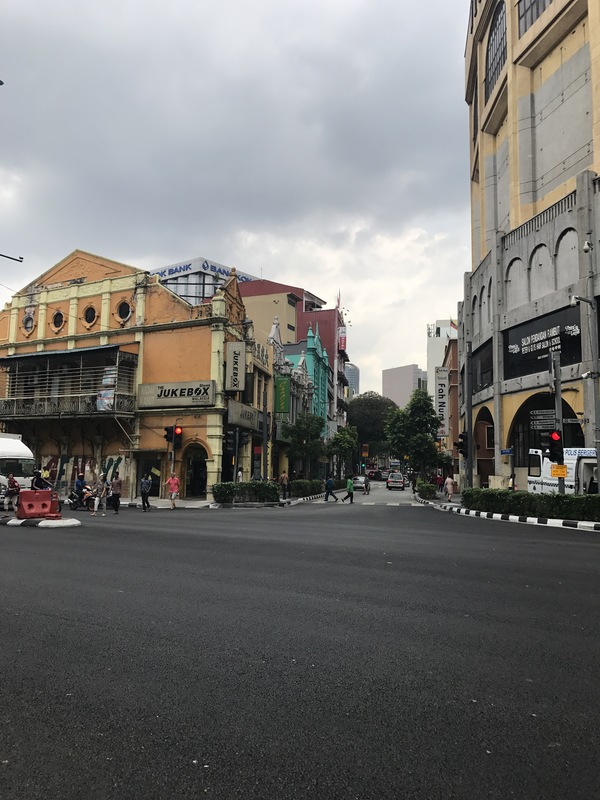 We’ve been to Singapore before so we know what to expect with Singapore, but Vietnam and Malaysia are firsts for us so it’s all about planning and preparation. I’ll try to keep this short so it doesn’t sound too exhausting. Visa requirements: Please check the validity of your passport as some countries want more than 6 months before it expires. Check whether you need visas before you travel! For British citizens you don’t need a visa for Malaysia or Vietnam but it’s always a good idea to double check with the embassy. Travel Insurance: We always buy travel insurance when we travel, and some U.K. banks offer this as part of their service so check with your bank. Ensure they cover all your family members and the country you’re going to. Check that there is health cover to include the cost of hospital stay, in the unlikely event that something happens. Travel money: I normally use the internet to compare the best deal to buy foreign currency and then get it delivered. So shop around! Check with your bank about the exchange rate for using your credit card abroad as these little things add up. It is also a good idea to inform your bank that you will be travelling. I use Compare currency to fund a good deal, but there are so many more options available. Holiday essentials: For my family, our essential list include the folllowing: Sunblock , insect/ mosquito repellent, hats , sandals (spare ones for the kids), sunsuits for the children (to protect their skin from sunburn whilst in the water), swim nappies (because they are better than normal ones for a pool or beach and so far I’ve not seen them in supermarkets in Singapore). I normally pack a few essential toys and book for the baby and take entertainment for my son, like a tablet, toys and books he enjoys (comic books at the moment). For myself I pack my essential makeup and skincare products (for my face). My hubby – well his essentials are mostly in the form of gadgets! Travel health: Travel vaccines are advisable so check if you need them before you fly. Singapore, Vietnam and Malaysia are fairly low risk for malaria, but do check before you travel whether you need them or not. Most importantly I take a medicine bag with things like paracetamol and ibuprofen (for adults and kids), loperamide, gaviscon (sachets), and an antihistamine of some kind. I also pack a little first aid kit, you can buy these at most pharmacies. My children suffer with eczema so I take a tube of hydrocortisone (prescribed) and their skin moisturiser (one I could use in the bath/ shower). I also pack a soothing cream in case they get bitten by mosquitoes. The long haul flight: Between myself and my hubby, we take a few essentials for the plane. Our six year old son takes his own back pack with his “essentials”. Investing in children’s headphones 🎧 is a must, these are much more comfortable than bog standard plane ear plugs. I normally download movies, interactive apps with games( puzzles etc) on the tablet for my son. Most importantly, I pack a few snacks for him. I can entertain my daughter with a few key toys, her favourite book and also a few videos on the tablet. I normally have a huge back pack for long haul flights , because I can take everything I need and it easy to carry as a back pack. I take a small push chair that can lay flat for the baby to sleep and can also folds down quite easily. I’ve had my current one for 5 years now! In my back pack, I take pjs for myself and the kids so we can be comfortable on the plane (my hubby also packs his pjs). I take spare change of clothes for both children,(nappies and wipes of course) toothbrushes and toothpaste (some airlines will give you these but for the kids I’d rather give them their soft ones). I always take a selection of snacks for the children and some drinks. My daughter still has a bottle so I take hers. She drinks normal milk so I buy little UHT packs at airport. There are various formula options at the airport too so we are spoilt for choice. We are flying at 6pm so arriving at the airport early is essential since l’ll have to feed the children dinner before we get on the plane. The time you fly is important, night flights the children sleep and I don’t have to entertain them, day flights (in my opinion) are a bit tricky. There are several accessories you can buy to help make your kids journey more comfortable, for example, the Fly tot inflatable cushion that fits in the space between your seat and the one in front. This adds an “extension” to the seat so your children can be more comfortable. Once they are sorted hopefully you will be able to relax. Remember to stay hydrated during the flight and do some inflight exercises. I hope you find this helpful. 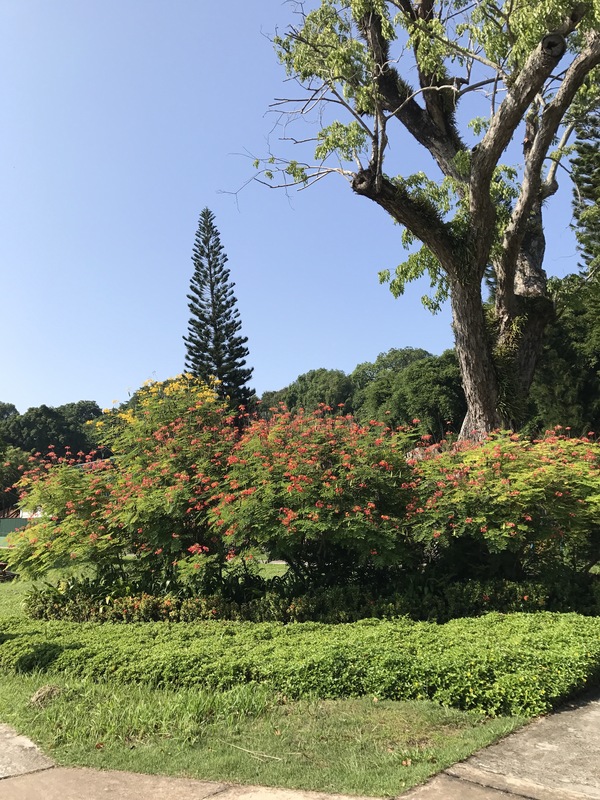 Enjoy your summer and look out for my next blog on things to do in Singapore with kids- a local perspective!